The iclickntrade™ Proprietary Indicator Package has been developed to help identify high probability trade entries for all markets. This package has analyzed information from a number of indicators to formulate one indicator with the aim of preventing multi-collinearity. This is a statistical term that refers to multiple counting of the same information and which is a common problem in technical analysis that occurs when similar indicators are applied to one chart leading to redundant signals that can be misleading in accurately evaluating market conditions. Maintaining a clean charting workspace by removing extraneous indicators that cause information overload leading a trader to being unable to interpret a large amount of data in a timely manner has also been a driving factor for the development of this package. Simplicity is key; therefore, for further clarification in identifying uptrends and downtrends, colors have been added to ensure that a trader can see at a glance the trading cycle of a particular market. Yellow and Green colors are used for the uptrends while Blue and Red colors are used for the downtrends. A trading cycle flows from Yellow to Green to Blue to Red and then restarts at Yellow. The Yellow and Blue colors are also known as gap trading within the trading cycle. Numbers tell the story by removing emotion. Therefore, sequential numbers from 1 – 9 have been developed and added to the indicators in the primary chart to identify where the market is positioned at a particular interval when using 1, 5, 15, 30, 60 minute charts as well as hourly, 4 hourly, daily, weekly or monthly charts for all markets. Sequential numbers have also been added to the stochastic oscillators in the sub chart to match the colors and sequential numbers in the primary chart for further confirmation where the market is overbought above the 80 level or oversold below the 20 level. The technical analysis work has been done! These Indicators are only compatible with FXCM MetaTrader 4 software. 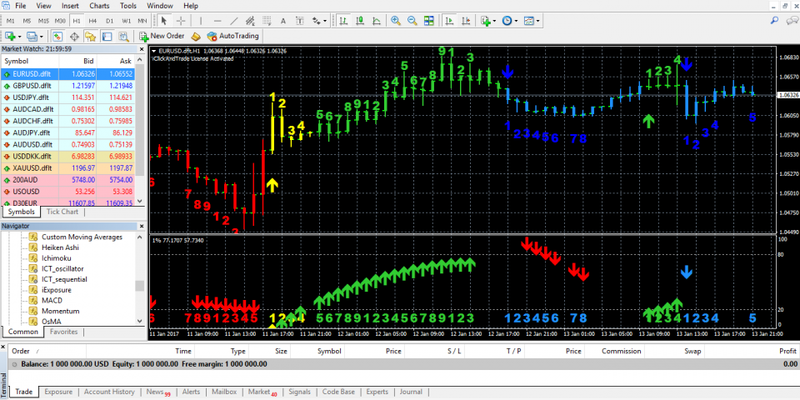 They do not operate on MetaTrader 4 software provided by any other brokerage. Additionally, an FXCM account is required (including free FXCM demo accounts). FXCM is an independent legal entity and is not affiliated with Trading Dynamics. Trading Dynamics is not owned, controlled, or operated by FXCM and Trading Dynamics is not an employee, agent or partner of FXCM.